Have questions about wrongful death? Below are some wrongful death frequently asked questions we often receive. If you have additional questions, please contact us. A wrongful death claim can arise whenever a person dies as a result of the wrongful conduct another person or a corporation. If that happens, one or more of the surviving family members can bring an action in court to recover damages for the person’s death. That type of claim is known as a wrongful death claim. All states recognize wrongful death claims under various statues but each state, like Colorado, has its own particular statutory rules governing wrongful death claims. When someone dies because of the fault or negligence of another, the spouse, heirs, or parents of the person who died may be entitled to bring a lawsuit to recover monetary damages against the person or entity whose fault or neglect caused the death. In Colorado, as in other states, such wrongful death cases are governed primarily by statutes enacted by the legislature. Colorado’s Wrongful Death Act is codified as C.R.S. §§ 13-21-201 to 13-21-204. Under C.R.S. § 13-21-202, a wrongful death action may be successfully maintained if the person who died, had she survived, would have been legally entitled to recover damages against the person or entity who caused the injury or condition resulting in death. Any defenses, such as comparative negligence or assumption of risk, which would have applied to the decedent’s bodily injury claim, had she survived, likewise apply to any wrongful death claim brought by the decedent’s spouse, heirs or parents. For instance, if the decedent’s own negligence or fault was equal to or greater than the fault or negligence of the defendant, then the wrongful death claim will fail, and the plaintiff will not be allowed to recover. A wrongful death claim may be based upon any kind of fault or negligence which causes the death of another person. Most wrongful death actions arise out of car accidents or other types of motor vehicle accidents. Wrongful death cases are also often based upon industrial or workplace accidents, fires and explosions, defective conditions of premises (premises liability), defective products (products liability), aviation accidents, and substandard medical, surgical, hospital or nursing home care (medical malpractice). Sometimes wrongful death actions may arise out of homicide cases, including cases of murder-suicide. At Giometti & Mereness P.C., we are highly experienced in handling wrongful death cases arising from many different circumstances, including car crashes, motorcycle accidents, truck accidents, workplace injuries, fires, defective products, medical malpractice and murder-suicide. We have successfully pursued wrongful death claims on behalf of clients whose loved ones have died, and we have successfully defended many actions on behalf of persons or entities against whom such claims have been brought. Wrongful death claims are almost always difficult, emotionally charged cases. The legal issues involved in such cases can be challenging and complex. During our decades of legal practice we have found there is no such thing as a simple or easy wrongful death case. At Giometti & Mereness P.C., our experienced attorneys can guide you through the challenging experience of pursuing or defending a wrongful death claim, maximizing the likelihood of a successful outcome. Colorado law establishes priorities for who can bring a wrongful death action. The basic purpose of wrongful death law is to provide financial compensation for the person’s who relied financially upon the person who was killed. Given the statutory purpose, Colorado law gives the surviving spouse the exclusive right to bring a wrongful death action during the first year after death. During the second year after death, the heirs, meaning the children of the person who was killed, can also initiate a wrongful death action or can join an action brought by the surviving spouse. If there is no surviving spouse or there are no children, then the parents from the person who was killed also can bring a wrongful death action. Interestingly though, under Colorado law, even if there is no surviving spouse, no children, or no parents, the brothers and sisters of the person was killed have no right to bring a wrongful death action. One of the first questions that must be addressed in any wrongful death case is: who are the people who are legally entitled to bring an action to recover damages. Another way of phrasing this question is: who has “standing to sue.” In Colorado, C.R.S. § 13-21-201 governs who may bring a wrongful death action. During the first year after death, this statute gives priority to the spouse of the decedent to commence a wrongful death action. If there is no spouse, a wrongful death action may be brought by the heirs of the decedent, and, if there are no spouse and no heirs, by the decedent’s parent or parents. In the second year after death, a wrongful death action may be commenced by the spouse or heirs of the decedent. Under Colorado law, the term “heirs” has been narrowly construed by the courts. For purposes of the Wrongful Death Act, the term “heirs” includes only lineal descendants of the decedent, and does not include siblings or parents. Parents have standing to bring an action for the wrongful death of a child only if the child is not survived by a spouse or heirs. This is true even if the spouse elects not to pursue a wrongful death claim. Under Colorado law, if the decedent is not survived by a spouse, heirs or parents, siblings still have no standing to maintain a wrongful death action, even if such siblings are the decedent’s only surviving relatives. Pursuant to a recent statutory amendment, a “designated beneficiary” of the decedent may also have standing to bring a wrongful death action, in lieu of, or in addition to other parties with standing enumerated by the statute. In many cases, accidental injuries do not cause immediate death, and a person who dies as a result of an accidental injury may have incurred substantial medical expenses before passing away. In such cases, the decedent’s personal representative may initiate an action under the “Survival Statute,” C.R.S. § 13-20-101, to recover such medical expenses and other economic damages, such as lost wages, the decedent incurred before he died. However, damages are not recoverable for the pain and suffering endured by the decedent before death, no matter how horrendous the circumstances. An action under the Survival Statute may proceed side by side with an action under the Wrongful Death Act, and the two are not mutually exclusive. In most, but certainly not all cases, the decedent’s personal representative will also be one of the persons with standing to bring a wrongful death case, such as the decedent’s surviving spouse. Under Colorado law, wrongful death claims are not assignable. In the majority of cases, the issue of who has standing to bring a wrongful death action is easy to revolve. However, there are often difficult cases, where parties have conflicting claims, such as situations where a person claims to have been in a common law marriage with the decedent, or where a child claims to be an heir of the decedent, but paternity has not been established. Such scenarios may result in conflicts of interest between parties with competing claims. At Giometti & Mereness P.C., our attorneys have extensive experience handling these challenging issues. Our attorneys can provide advice to guide you through what otherwise could be a troubling legal morass. Both economic and non-economic damages can be recovered in a wrongful death action. Economic damages are financial losses suffered by the surviving family members of the person who died such as loss in income or support that would have been received from the person who was killed if he or she had survived. Non-economic damages are damages for grief, sorrow, and loss of companionship that were cause by the person’s death. There are some very complicated rules in Colorado governing these types of damages. What rules do Colorado statutes have about damages recoverable in a wrongful death claim? Generally, there’s no limit to the amount of economic damages that can be recovered in a wrongful death action. Economic damages or loss of financial support sustained by the surviving spouse or children, non-economic damages for grief, sorrow, and loss of companionship are also recoverable, but those damages are limited by statute to an amount of $436,070. There are some exceptions to these general rules, however. One exception is that where a person dies without leaving a surviving spouse, minor children or a dependent mother or father. The total amount of damages recoverable is also capped at $436,070. Another exception is that if the person’s death is the result of a felonious killing, all of the statutory caps on damages are lifted and a much higher amount can potentially be recovered for non-economic damages. Another significant question that must be evaluated in any wrongful death case is what damages are recoverable by the persons who have standing to bring the claim. This important issue is governed by C.R.S. § 13-21-203. Until as recently as 1989, damages recoverable in a wrongful death case were limited to the “net pecuniary loss” suffered by the plaintiff as a result of the decedent’s death. Many judges and attorneys viewed this statutory restriction on recoverable damages as highly inequitable because grieving parties were not allowed to recover non-economic damages for grief, sorrow and loss of companionship of their loved ones. In 1989, the Colorado legislature remedied this inequity by amending C.R.S. § 13-21-203 to permit recovery of non-economic damages for grief, sorrow and loss of companionship suffered by the decedent’s surviving spouse, heirs or parents. Under current law, both non-economic and economic damages may be recovered in a wrongful death action. Determination of non-economic damages is generally quite subjective, as the amount of damages recoverable depends upon proof of the closeness and duration of the relationship between the decedent and the surviving parties. Generally, economic damages are not subject to a statutory cap, but the amount of recoverable damages is still measured by the net pecuniary loss sustained by the plaintiff. The net pecuniary loss is the amount of support the decedent would have provided to the plaintiff had the decedent survived. Except in the case of a “felonious killing,” the total amount of noneconomic damages recoverable by all plaintiffs for the death of a single decedent is subject to a statutory cap, which, adjusted for inflation, is currently $436,070. In addition, except in the case of “felonious killing,” the total amount of all damages recoverable, both economic and noneconomic, for the death of a decedent who is not survived by a spouse, minor children or dependent parents, is currently capped at $436,070. These statutory caps can be lifted if the plaintiff can prove that the decedent’s death resulted from a “felonious killing.” As defined in C.R.S. § 15-11-803(1)(b), a felonious killing includes first degree murder, second degree murder, or manslaughter. A criminal conviction of the defendant is not necessary to establish a felonious killing. Under C.R.S. § 15-11-803(7), notwithstanding the disposition of a criminal proceeding, an interested person may petition the court to determine whether the elements of a felonious killing have been established. Even in cases where the at-fault party is criminally convicted of a lesser offense, such as vehicular homicide, the court in a wrongful death action, applying a preponderance of the evidence standard, may independently determine whether the conduct of the at-fault party constituted a felonious killing. The attorneys at Giometti & Mereness P.C. have substantial experience dealing with the difficult and complex issues of damages recoverable in wrongful death actions. We can help you obtain the best outcome the evidence warrants in your case. What is the solatium amount? Can punitive damages be recovered in a wrongful death action? Given the stressful, emotionally charged nature of wrongful death claims, the plaintiff may not wish to testify in court regarding the loss of her relationship with the decedent. The facts may simply be too painful to relive for the plaintiff to endure the ordeal of testifying in open court about her grief, sorrow and loss of companionship. In other cases, the plaintiff may have had a distant, or even estranged, relationship with the decedent, and non-economic damages may be difficult to prove. To address these special circumstances, the Colorado legislature adopted C.R.S. § 13-21-203.5, which permits the plaintiff in a wrongful death case to elect in writing to recover the “solatium amount” in lieu of presenting proof of actual non-economic damages. Currently, the solatium amount, adjusted for inflation, is $87,210. Because recovery of the solatium amount requires no proof of any actual damages, the solatium amount represents the “floor value” of any wrongful death claim under Colorado law. Ordinarily, in wrongful death claims (as in tort cases generally), the amount of damages recoverable by the plaintiff is subject to reduction by the percentage of fault or negligence charged to the plaintiff or to any designated non-party. However, the solatium amount is not subject to reduction for any comparative fault attributed to the decedent, or any negligence or fault attributable to a designated non-party. The Colorado Supreme Court has held that, once the liability of the defendant is established, the plaintiff is entitled to recover the full solatium amount, without any reduction for the comparative negligence of the decedent. Generally, in tort actions in Colorado, punitive damages, also known as exemplary damages, are recoverable where the plaintiff proves, beyond a reasonable doubt, that the actions of the defendant were accompanied by circumstances of fraud, malice or willful and wanton conduct. However, until the legislature amended the Wrongful Death Act 2000, exemplary damages were not recoverable in wrongful death cases. Pursuant to the amended Wrongful Death Act, C.R.S. § 13-21-203(3)(c)(I), a claim for exemplary damages may not be included in the plaintiff’s original claim for relief for wrongful death. However, sixty (60) days after the parties have exchanged disclosures, the plaintiff may be allowed to amend her complaint to add a claim for exemplary damages if she establishes “prima facie proof” of a triable issue. At Giometti & Mereness P.C., our attorneys are highly experienced in handling wrongful death claims where the solatium amount is sought, and in pursuing and defending cases involving claims for punitive damages. Our attorneys can provide valuable advice to you with these issues in your case. How is liability established (or refuted) in wrongful death actions? Pursuant to C.R.S. § 13-21-202, in a wrongful death action the plaintiff can recover if he can prove that the decedent, if she had survived the accident or injury resulting in death, would have been legally entitled to recover damages from the defendant. With respect to the determination of liability, this means that any defenses, such as comparative negligence, that would have applied to the decedent also apply to the plaintiff pursuing a claim for wrongful death. In Colorado, except with respect to certain types of cases, such as claims based upon product liability, to establish liability in a wrongful death case the plaintiff must prove that the percentage of negligence or fault charged to the decedent is less than the percentage of fault or negligence charged to the defendant or defendants, or to the combined percentage of negligence or fault charged to the defendant and any designated non-party. Under Colorado’s comparative negligence statute, C.R.S. § 13-21-111, the plaintiff is permitted to recover damages if the percentage of negligence charged to the plaintiff is less than the percentage of negligence charged to the defendant. If more than one defendant is named in the action, the plaintiff can recover if the percentage of negligence charged to the plaintiff is less than the combined percentage of negligence charged to all of the defendants. The damages recoverable by the plaintiff are subject to reduction by the percentage of negligence charged to the plaintiff. Under Colorado’s pro rata liability statute, C.R.S. § 13-21-111.5, within 90 days of the commencement of an action, a defendant may designate any non-party whose negligence or fault caused or contributed to the injury and death of the decedent. When such a non-party is properly designated, his name will appear on the verdict form presented to the jury at the end of the trial, along with the name(s) of the defendant(s). The amount of damages recoverable by the plaintiff in a wrongful death action is subject to reduction by the percentage of negligence or fault assessed to any such non-party, in addition to the percentage of negligence or fault charged to the plaintiff. As an illustration, if the plaintiff in a wrongful death action proved damages of $500,000, and if the decedent was assessed 20% of the negligence resulting in his own death and 20% percent of the negligence was assessed to a designated non-party, the plaintiff’s damages would be reduced by 40%, and the plaintiff’s recovery would be $300,000. More often than not, issues of liability in wrongful death cases present complex factual questions as to whether the defendant breached a duty of care owed to the decedent and whether, if such a breach occurred, the defendant’s conduct caused the decedent’s death. Resolution of these factual issues usually requires the retention of one or more experts, such as accident reconstruction experts, engineers or medical specialists. At Giometti & Mereness P.C., our attorneys are experienced in working with experts to resolve complex issues of liability and causation. In your case, we can help you successfully navigate the treacherous sea of complex liability and causation issues. How are the proceeds of a wrongful death action distributed? Another somewhat complicated issue under Colorado law is how the proceeds of a wrongful death action are divided. The division of the proceeds of a wrongful death lawsuit or settlement are governed by the laws of intestate succession, meaning, the laws that govern how property is divided and distributed if a person dies without a will. There may be some cases in which people who are not even parties to the wrongful death action have an entitlement to recover some of the proceeds of the wrongful death case, such as in a case where a spouse brings a wrongful death action but there are also children from a prior marriage who may have a right or entitlement to share in the proceeds. Generally, in tort actions for recovery of damages for injury to person or property, the plaintiff who brings the lawsuit is entitled to recover 100% of the damages awarded against the defendant. As an exception to this general rule, the plaintiff may be required to reimburse health insurance providers or other insurers claiming a subrogation interest. However, in a wrongful death action, the plaintiff who initiates the lawsuit against the defendant is not necessarily entitled to recover 100% of any damages awarded. Rather, such damages are subject to allocation and distribution pursuant to the provisions of C.R.S. § 13-21-201(2). Special rules also apply to parents who are divorced, separated or living apart. Under C.R.S. § 13-21-201(2), the recovery or judgment in a wrongful death action “shall be owned by such persons as are heirs at law of the deceased under the statutes of descent and distribution and shall be divided among such heirs at law in the same manner as real estate is divided according to said statute of descent and distribution.” This statute was written in the 19 century, when, apparently, there was a statute of descent and distribution governing real estate. However, under current Colorado law, there is no specific statute governing distribution of real estate of a decedent. Instead, the distribution of property after death is governed by the laws of intestate succession contained in the Colorado Probate Code, C.R.S. §§ 15-11-101 et. seq. In each case, these statutes must be carefully reviewed to determine who is entitled to share in the proceeds of any wrongful death action. Pursuant to C.R.S. § 13-21-201(1)(c), in cases where a wrongful death action is brought by parents who are not divorced, separated or living apart, each parent is entitled to an equal share of any recovery for wrongful death of the child. However, if the parents are divorced, separated or living apart, either may file a motion requesting the court to fairly apportion the proceeds of the wrongful death action. If such a motion is filed, the court is required to conduct a post-judgment hearing, at which both parents may present evidence regarding their relationship with the deceased child. In apportioning damages, the trial court must consider factors such as “custody, control, support, parental responsibility, and any other factors the court deems pertinent.” The terms “father” and “mother” as used in this statute do not include persons whose parental rights have been legally terminated. In cases where multiple parties are seeking to recover damages for the death of one decedent, there is a potential for conflicts of interest to arise. When claims involve multiple parties who have a right to share in the recovery, it is usually necessary that any settlement extinguish the claims of any party who has a claim to recovery. The attorneys at Giometti & Mereness P.C. are highly experienced in dealing with issues regarding distribution and apportionment of damages in wrongful death cases, including settlement of cases involving multiple parties. We can assist you to make sure your case is properly and satisfactorily resolved. For whose death may a wrongful death action be maintained? What is the statute of limitations for bringing a wrongful death action? In Colorado, a wrongful death action may be brought for the death of any “person.” Colorado courts have held that a child who is born alive but who dies after birth is a “person” for purposes of the Wrongful Death Act. For example, if a child suffers prenatal injuries and is born prematurely and subsequently dies as a result, the parents of the child may maintain a wrongful death action against the person or entity who caused the injuries. The rule that a child born alive is a “person” for purposes of the Wrongful Death Act applies regardless of the viability of the fetus. For instance, in a case where the mother, who was 22 weeks pregnant, was injured in a car accident, and the child was born alive and died a little more than an hour after birth, it was held that the child was a person for purposes of the Wrongful Death Act and that a wrongful death action could be maintained regardless of whether the child was viable at the time of injury or at the time of birth. A wrongful death action may also be maintained for the death of a fetus, if the evidence demonstrates that the fetus was viable at the time of injury. Generally, a wrongful death action brought for the death of a fetus is not subject to summary dismissal. Rather, the factual determination whether the fetus was viable must be made through the production of evidence at trial or during the summary judgment stage of the case. Generally, regardless of the legal theory upon which a wrongful death claim is brought, the statute of limitations for commencing a wrongful death action is two years from the date of death. However, certain claims may be subject to shorter limitations periods. For instance, the statute of limitations for bringing an action under Colorado’s Dram Shop Act, C.R.S. § 12-47-801, is one year. Under the Dram Shop Act, a claim may be brought against a tavern owner who willfully and knowingly sells or furnishes alcoholic beverages to a visibly intoxicated person or a person under 21 and that person subsequently causes a motor vehicle accident resulting in injury or death. A claim may also be maintained under the Dram Shop Act against a social host who knowingly furnishes alcoholic beverages to a minor, or who knowingly provides a minor a place to consume alcoholic beverages. In wrongful death cases where the at-fault driver was driving under the influence of alcohol, it may be valuable to investigate whether a claim exists under the Dram Shop Act, to determine whether a tavern owner or social host may be named as an additional defendant or designated as a non-party at fault. Why should you consider retaining Giometti & Mereness P.C. to pursue your wrongful death claim or defend wrongful death actions? We do not exaggerate by saying we literally “wrote the book” on wrongful death law in Colorado. 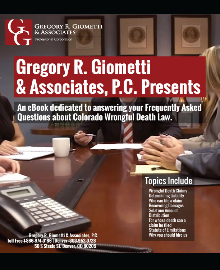 Gregory R. Giometti is the author of Colorado Handbook of Wrongful Death Law, first published in 1997 by C.L.E. in Colorado, Inc., the non-profit educational arm of the Colorado Bar Association. The book has since been updated several times, most recently in 2010. Since 1997, Mr. Giometti has taught and spoken at numerous professional seminars about wrongful death law and the handling wrongful death claims. Mr. Giometti has successfully handled wrongful death claims arising from many different scenarios, including: car accidents, truck accidents, motorcycle accidents, pedestrian accidents, fires, explosions, workplace accidents, nursing home and day care accidents, homicides and murder-suicides. When other lawyers in Colorado have questions about complex issues in wrongful death cases, they often call Gregory R. Giometti & Associates, P.C. for a consultation. Was recognized in 2012 as of the best attorneys in Colorado, as published in Best Lawyers. Wrongful death cases are almost always difficult and emotionally charged. Very often they involve complex factual and legal issues. Whether you are pursuing a wrongful death case or you are charged with the responsibility of defending a wrongful death case or cases, Giometti & Mereness P.C. can provide you the thorough, conscientious and competent representation you need to achieve a successful resolution in a challenging situation. (1) AV, BV and CV are registered certification marks of Reed Elsevier Properties, Inc., used in accordance with the Martindale-Hubbell certification procedures, standards and policies.